Whether it is a piece of data, an annual event or a job vacancy, Leeds Data City is creating a place to discover the great assets Leeds has to offer. Data City Leeds is a platform run by ODI Leeds the regional node for the Open Data Institute. They know that the region is amazing, they want to make it easy for the rest of the world to see that too. The data city will develop an ever growing database of the assets in our region and build data visualisation tools to help visitors to the platform understand the strengths of our region. They will use this to attract inward investment, create opportunities, create jobs and drive economic success. With 3,590 assets registered Leeds Data City need you to tell them what you are doing, register your organisation, project, people, skills or whatever you think is an asset to the economy of Leeds. 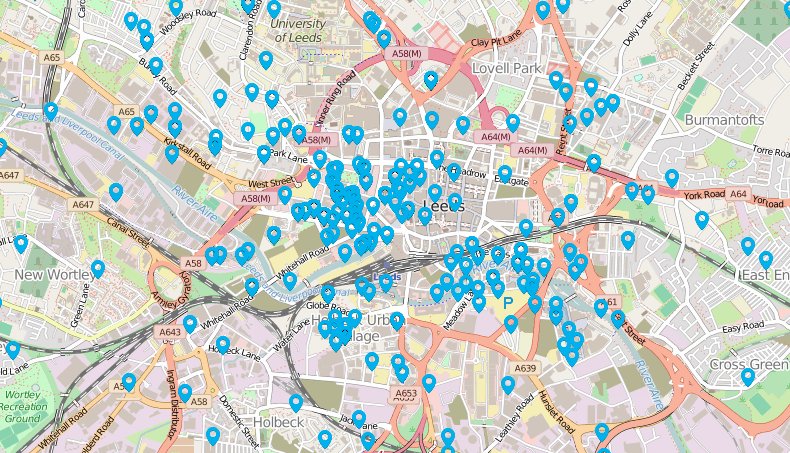 To access the map, click on the website link above and search for Leeds assets by searching for them or just click go.